Lately I have moving on the brain since we’ve been helping my parents downsize to a much smaller home. It’s such a difficult thing to do….pack up everything you own into a pod or storage room to carry hundreds of miles away to the next location. It’s emotionally draining and physically difficult, so I thought I’d share some tips on how we made it a little easier. There’s nothing like a good old fashioned list to help you get everything out of your brain. The amount of little things to do is overwhelming. So make as many lists as you need and use just plain paper and pencil (instead of on your phone) so everyone that is helping can see the list too. Hint: Print out this moving checklist to help you get started! Look at your possessions with an open mind. If you haven’t used it in over a year, no matter how much you love it, let it go! I have a general rule that I set aside one large box for those types of things, and that’s all I can keep. If it won’t fit in the box, I get rid of it. It can be hard to do, but once it’s gone you’ll be glad. I like to go room by room. Once the drawers and closets are cleaned out, I evaluate the furniture in each room and decide how it will be packed for travel. I then designate different parts of the house for each method (moving truck items in the dining room, pod items in the living room, etc) and I start sorting. Once a room is empty I close the door. Done. Slowly but surely it all begins to come together. 4. Have plenty of supplies. No matter what kinds of boxes you are using, have everything you need to fill them. Packing tape (and a few extra rolls), markers, bubble wrap, old towels, newspaper, etc are all necessary for a smooth move. You’ll need lots more than you think. In the case of my parents’ move, I was going to be at their house helping them for 4 days, so I made a goal for each day. For example, day 1 was for emptying out all closets, drawers and cabinets and either throwing it out or boxing it up. Day 2 was for loading the pod (that was going into storage). Day 3 was for dealing with trash, taking what they didn’t want to the donation center and emptying out all of the rooms. Day 4 was for loading the truck. That helped us stay on track and not just wander around not knowing what to do. 6. Make every space count. Don’t put an empty dresser into the moving truck. Use those drawers to carry a lamp (well wrapped, of course) or some artificial plants. They won’t weight the dresser down and they won’t take up extra room, win-win. When you put your sofa on the truck, slide flat things under it. Under tables and inside vases are also often forgotten places also. For the littler ones that couldn’t really help, I had some new toys for them to play with. Once we emptied out the first room I put all of their toys in there and it gave them a whole place to play where they wouldn’t be under foot. I’d make sure they had snacks and treats to make them feel special, but they were told not to interrupt the moving workers unless absolutely necessary. As an added note, if you have really little ones or a baby, sometimes it’s better if you can stay out of the way. Maybe you can offer to watch someone else’s children while they help pack so the babies aren’t around during a move. Or hire an older child to watch them in the empty room so you can get more work done. Don’t be shy. People don’t usually mind helping if you ask for just a few hours of their time. Be sure to have snacks and cold drinks on hand for your helpers and be ready when they get there so their time isn’t wasted. 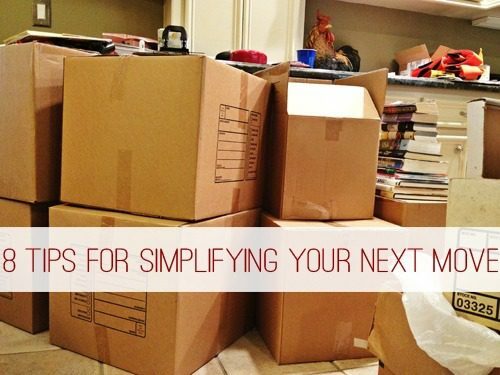 While moving is very stressful, using some of these tips has kept us from feeling too overwhelmed by the process. Remember, soon you’ll be in your new place and this will be a distant memory. Do you have any good moving tips?